On Chara Apartments, you can find alive colors, that will make up your mood. We will help you on every way that we can, to make you stay as good as possible. Our apartments have everything you need to make you feel like home. On Chara Apartments you can choose between 4 apartments on the first floor, or one apartment on the ground floor. All the apartments are for 2-4 people. 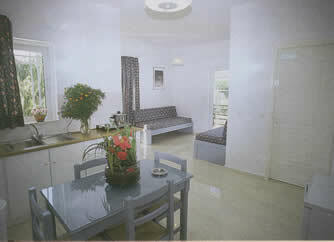 On the apartments you will find one bedroom, a big living room with kitchen, and a nice bathroom. 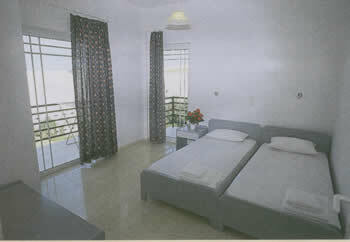 The apartments are fully equiped, with modern furniture, and big balconies. 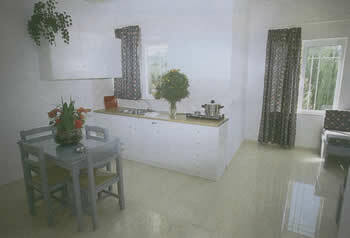 You will find there a kitchen with big table, fridge, and electrical cooking plates. For anything that you may need during your stay, we will immediatelly help you, as we live in one apartment on the ground floor. Our guests, can also use the swimming pool next to our hotel.